Weddings are a lot of work. When the final day arrives, you should sit back and relax, and let other people take over. And yet, at the day of the wedding, the bride and the groom are the ones who are the most exhausted – because of the ceremony, reception, dance, and the lot. Which means you need to be comfortable from head to toe. Talking about the toes (you know where this is going), you need comfortable shoes; and I’m not sure if people talk about this enough, as it may seem like a trivial detail. 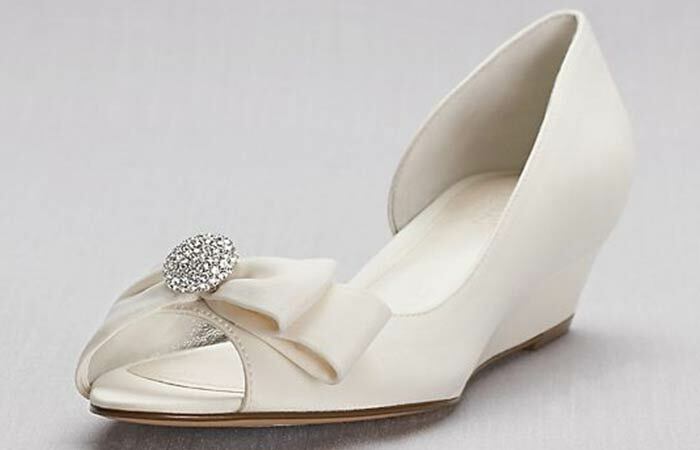 Yes, we talk about bridal wedding shoes, but we seldom think about comfort. So, maybe, it’s time we look at shoes that are as comfortable as they are stylish. Let’s do this. 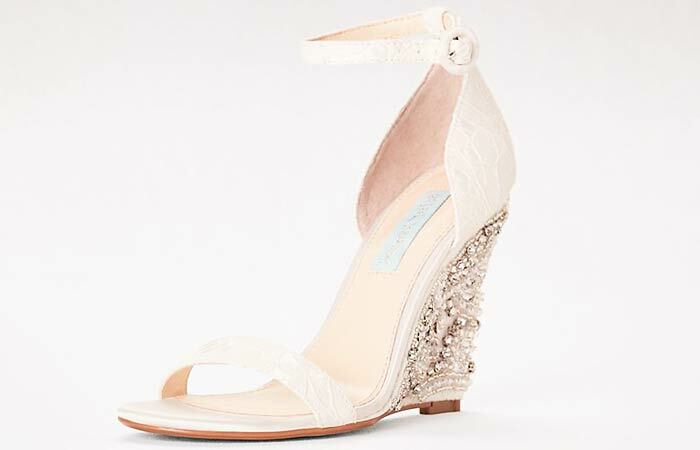 Honestly, elevated footwear looks best with bridal gowns that leave long trails – the higher, the better. However, if heels are not your thing, it’s not the end of the world. 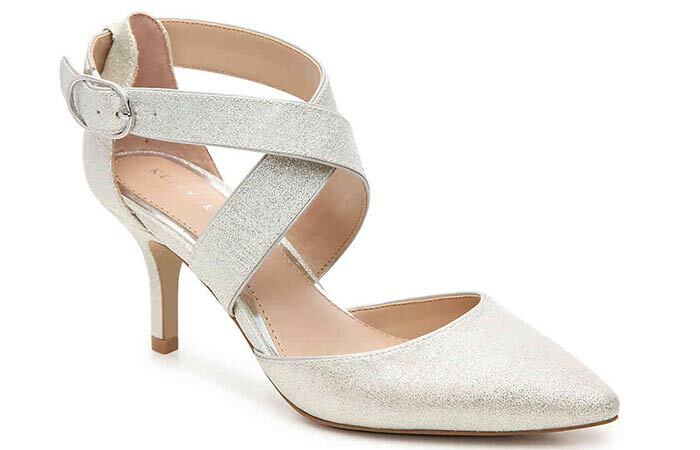 Opt for smaller heels like these swanky silver shoes that are just as ravishing. The zipper closure gives you better grip and is easy on your heels too. If your dress stops at the ankle, is asymmetrical or short – these are an excellent choice. Do you have a color coordinated theme? 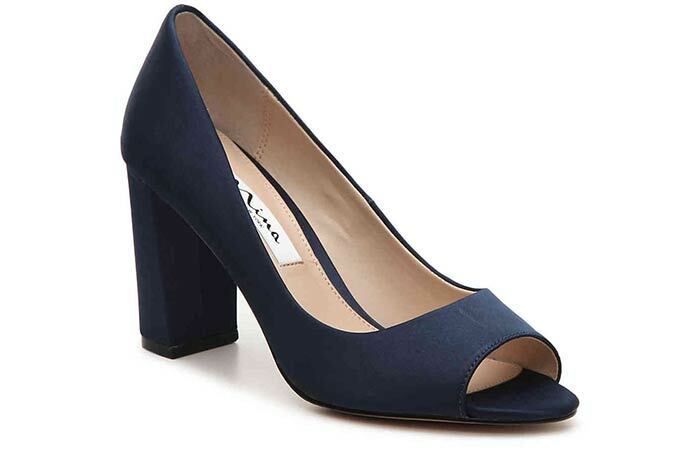 And, if that happens to be blue, which is a very sought after wedding color anyway, here are shoes that will fit right in. Block heels are finally catching up because they are stylish and people are starting to put comfort over just style. Since these give you both, give them a shot. If you do not want to go totally low on your heels – try something along these lines. 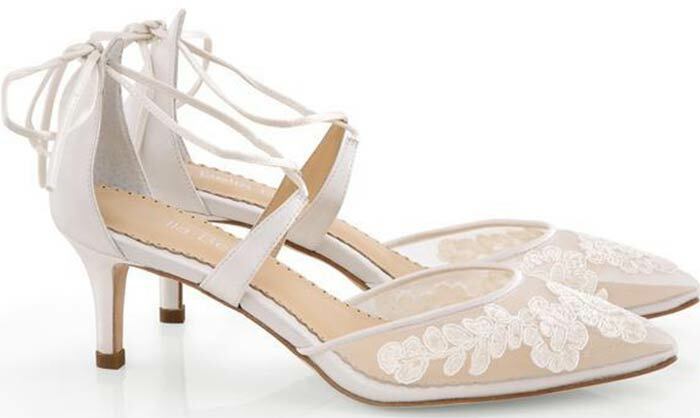 These breathtaking transparent white shoes scream bride, beautiful, and wedding. Have wedges on your mind? So be it, but let’s go with something special, different, and wedding-like. 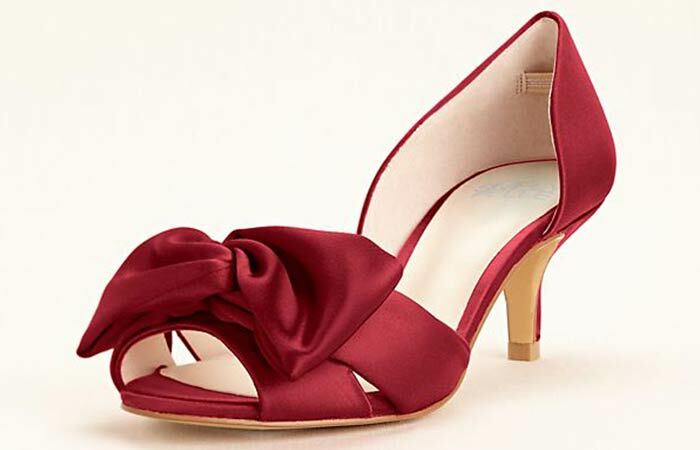 And, these low heel wedges with a satin bow and embellishments are something you can’t say no to. 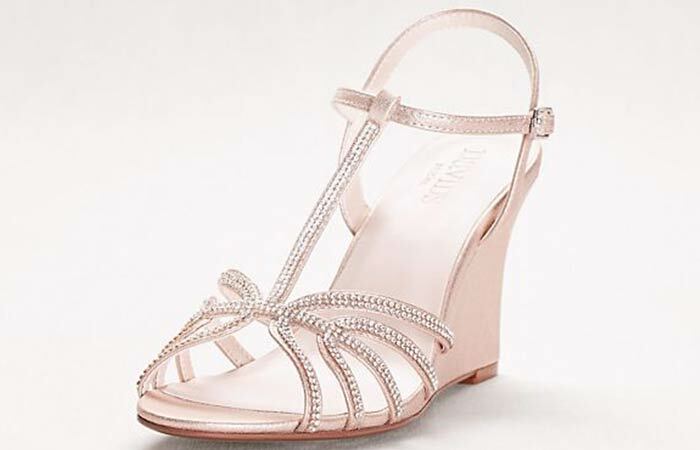 Flat ballerinas or peep-toes are unassuming as wedding sandals, aren’t they? But, hey, look at what’s out there, and you will be pleasantly surprised. The colossal accent on these peep-toes should be something you should consider if you have ballerinas on your mind. 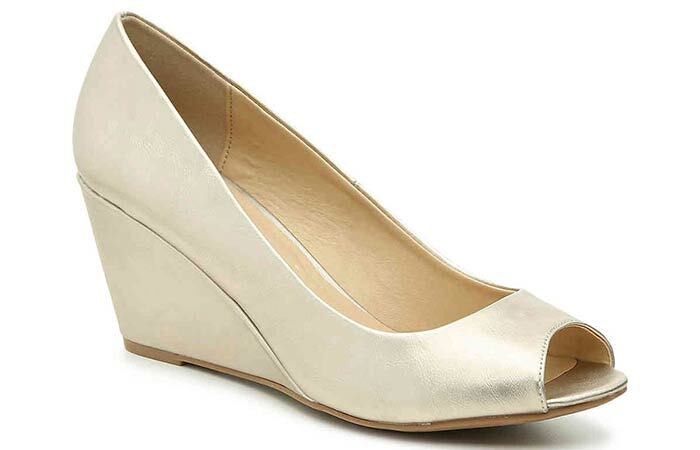 If you think heels are non-negotiable, and you cannot go back on that, go for wedges. 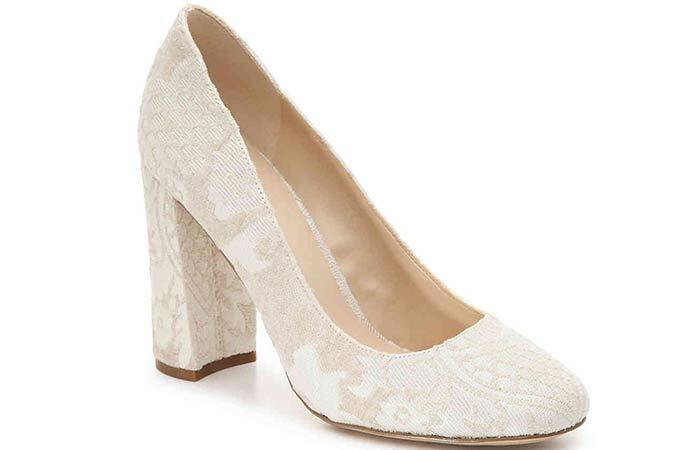 These are considered extremely stylish and have caught on to the bridal shoe shelves too. 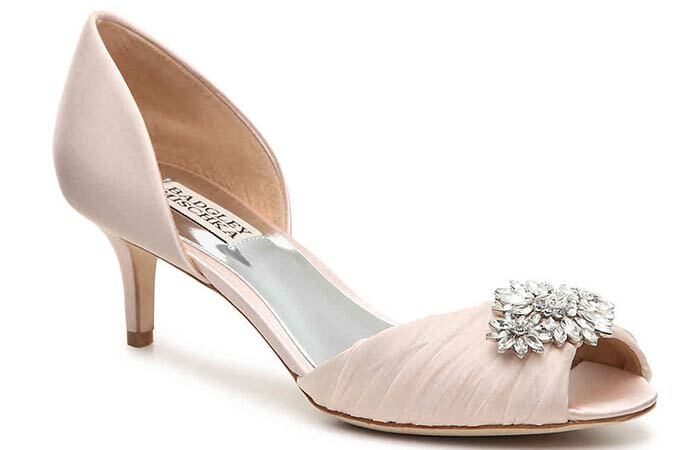 Brands like David’s Bridal, DSW, etc., which cater to wedding shoes, have a tonne of options. Enthralling is the first thing that comes to my mind when I look at these, and now cannot take my eyes off of these beauties. The illusion lace meshes for the front part of the shoes and the bow-tie at the rear look just amazing. Among all these, did you even realize that these are kitten heels? It doesn’t matter! 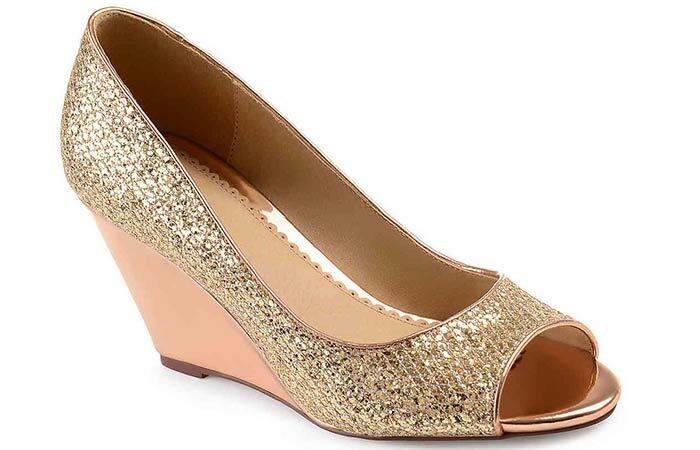 Here is yet another beautiful pair of wedges – for the love of high heels. These are elevated, but unlike those six inchers, give better grip to your feet and do not hurt even when you wear them for extended periods. The ankle strap adds to the comfort while the heavily embellished rear takes care of the aesthetic. Are you picking up a lace dress? Or, slightly inching away from white? 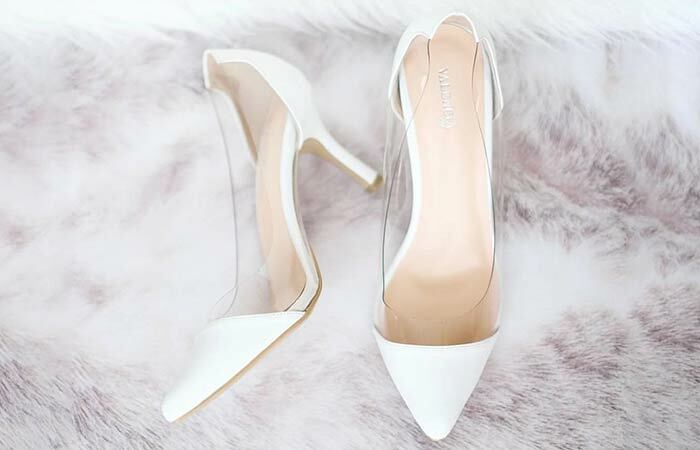 Pick these off-white block heels that will complement your dress and keep you comfortable. We need everything that glitters and more for our wedding. 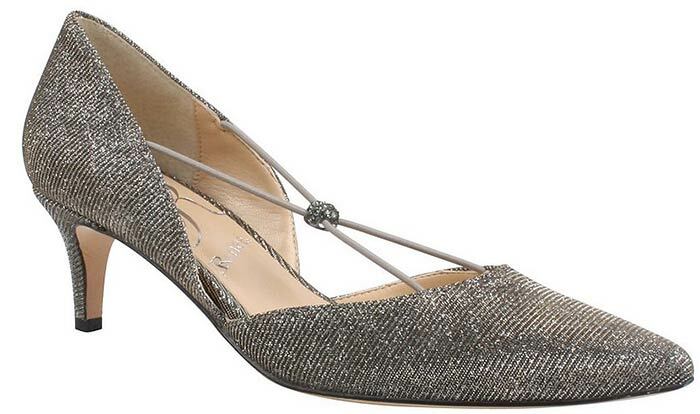 Add sparkle to these low toe-pointed heels and leave no stone unturned. These shoes come to prove that it’s always not about the heels. Black and gold is not the most obvious choice of color for wedding themes, except it is. Look up Pinterest, and you will realize that this color combo is a hot favorite of a lot of couples. Anyway, if this happens to be your theme, how about picking up these block heels to go with your white bridal gown and sweeping everyone off their feet? Ivory colored kitten heels with leather straps provide full coverage and protect your feet without taking away one bit of the elegance. Whoa! Who would have thought, right? Red pumps for the wedding! 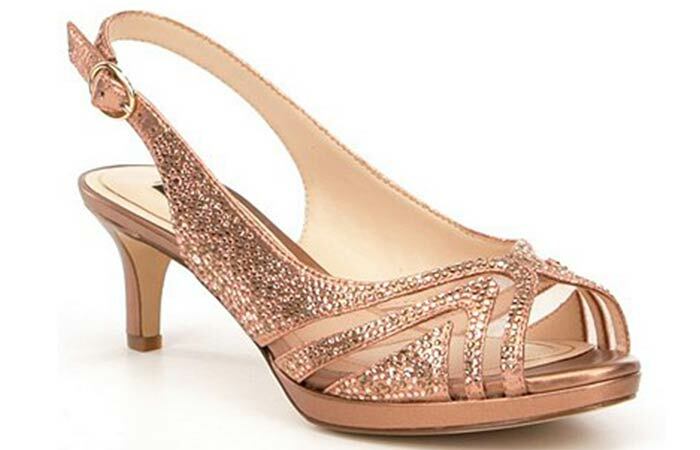 Don’t be surprised, but a lot of brides who choose offbeat colored wedding gowns also prefer shoes that stand out. And, what better color than red for the celebration? Do all of it with these kitten heels that come with a satin bow and steal the show. 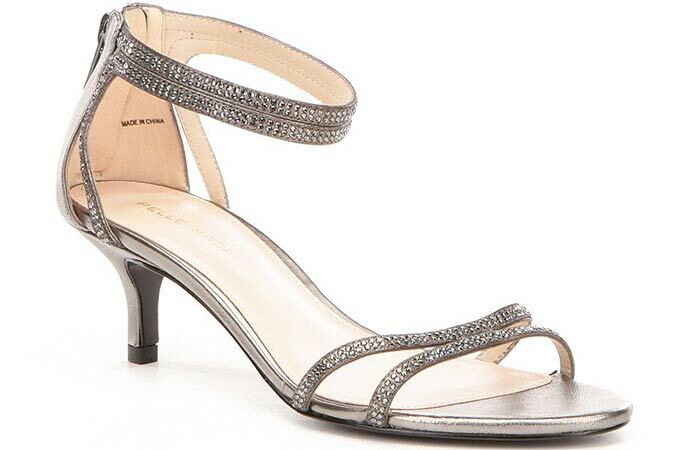 Go all out with these sequin peep-toes that have relatively smaller heels. Add shimmer and sparkle, and bring it on. If you have been wanting to steer away from heels, look at these – you will have no issues. 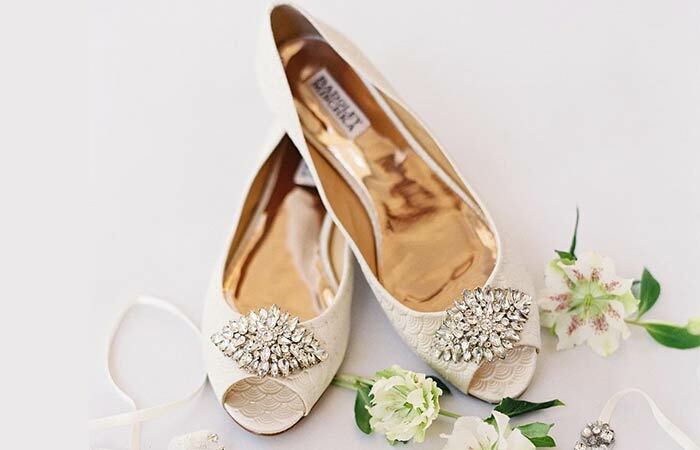 They are sparkly, high-heeled, and everything bridal shoes should be. Go for them – don’t have any second thoughts. 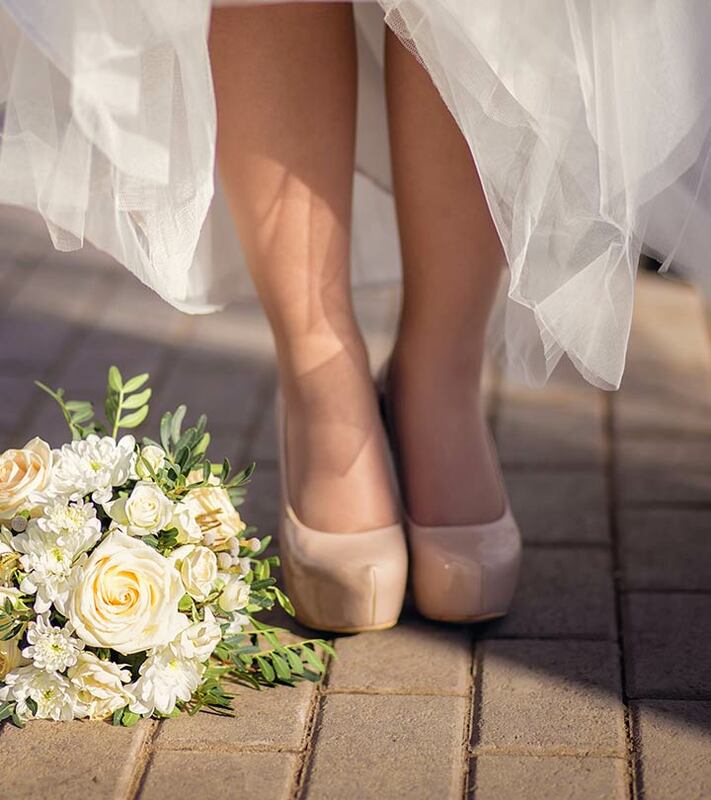 Our bridal wedding shoes have come a long way – literally and figuratively. 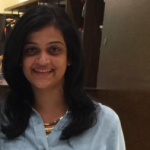 So, let’s opt for the pair that is both stylish and comfortable. 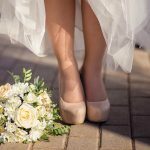 What do your dream bridal wedding shoes look like? Let us know all about it, you beautiful bride-to-be! Drop in a text in the comments section below.